Common in marshy ground and in moist meadows, prairies, and swamps. Nova Scotia west to British Columbia, south FL to AZ. 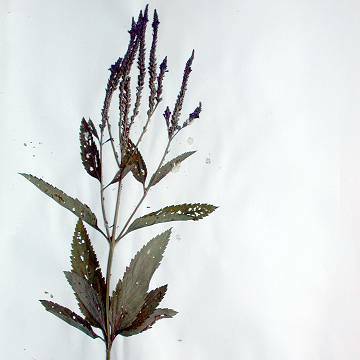 Herbaceous perennial to 1.5 m. Stems branching, with short, coarse hairs. Leaves lanceolate to lance-oblong or lance-ovate, to 18 cm, long acuminate, petiolate, coarsely serrate, often hastate (3-lobed at the base), glabrous or with short appressed hairs on both sides. Flowers in strict (straight and upright), short and compact spikes, usually many in a terminal panicle; bracts lance-subulate, often a little shorter than the calyx; calyx 2.5-3 mm, hairy, with more or less connivent lobes; corolla blue-purple, the tube a little longer than the calyx, hairy, 2.5-4.5 mm wide. Fruit a linear nutlet 1.5-2 mm, faintly striate or smooth. The seeds of this plant are edible but rather bitter and can be ground into flour. Soaking in cold water is said to reduce the bitterness somewhat.